It has been a busy and a bizzy February! I just got back from a short trip to New Orleans, and I had not seen the city since Hurricane Katrina in 2005. I didn't visit the Lower Ninth Ward or go on a self-guided photo tour of other areas that had been ravaged by Katrina, because I was working a lot and, in between, nursing a cold in the comfort of my hotel room. Still, it was good to see spirits so very high. The French Quarter was bustling and all outward signs say ongoing recovery. Esp. with the recent Saints Superbowl win. WHO DAT?! I have thought a lot about sewing but don't have much new clothing to show for it (but lots of crafting! I'm just not used to blogging those crafty projects...). Well, I have one new garment to share. After the sad news of Alexander McQueen's untimely death two weeks ago, I felt a little down and knew the best way out was to start one of the many sewing projects in my mental queue. 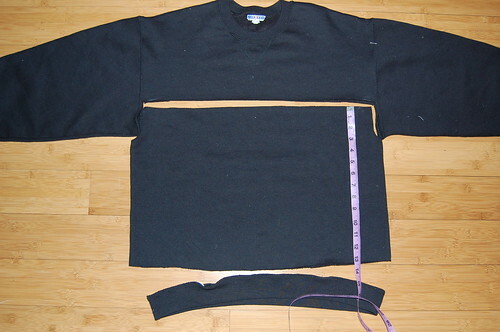 Behold: the simple sweatshirt reconstruction. 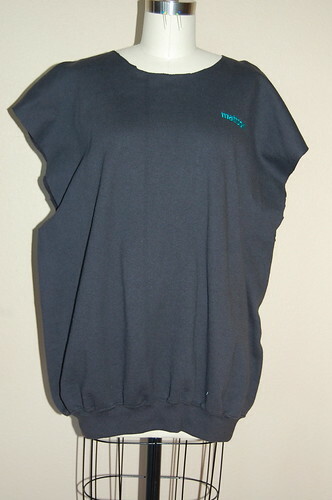 This is a simple one: In short, I deconstructed -- cut off the sleeves and neckband. That's all she wrote. I think my hips are proportionally sized to the rest of my body, so I was really curious to see how the volumized hips on this tunic/ dress/ thing would look. I wore it today and the hips are def. bigger than I'm used to... not sure if I will take it down a notch (or take it in an inch as the case may be). And this thing needs some pockets so I'll have to unpick the side seams a bit for that. The sleeves are longer than I'd like but that's what happens when you fudge the sleeves. I'll know better next time. 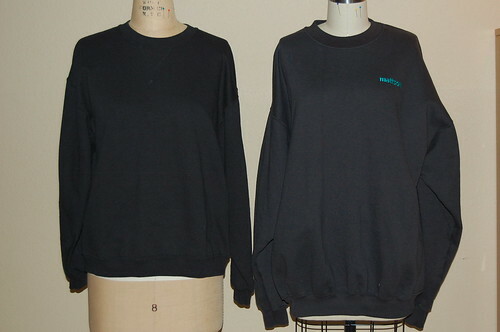 And if I may plug the sweatshirt a bit more, 'cause I'm not sure I'm making a great case for it based on the pics I just shared: cotton fleece is a dream to sew! I know it's a knit and many of us get scared away from sewing knits because they're so finicky. But if you're up for some knit experimentation, this is a pretty predictable fabric to mess with and get decent results. Hope you feel better and I love the sweatshirt dress!! 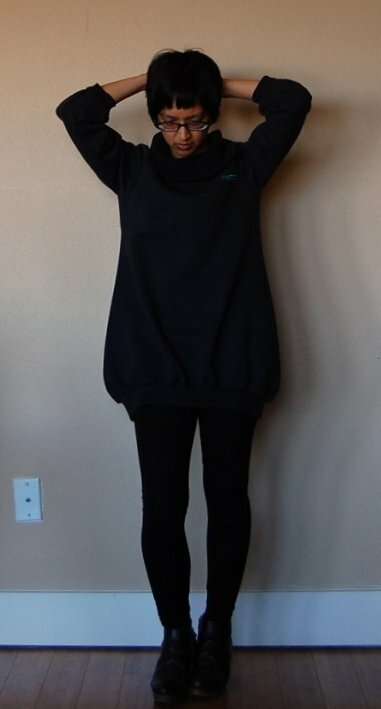 oversized sweatshirts are hard to beat for cold weather comfort. 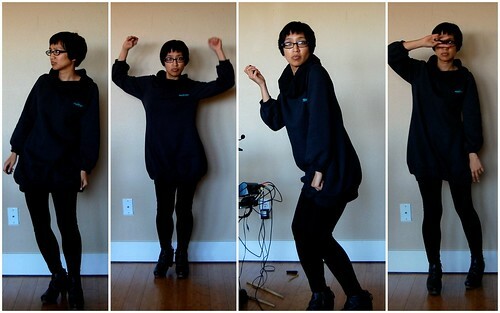 Which reminds me that I once made a sweater dress out of sweatshirting and loved it. I should make another one when it starts getting cold again. Nice dance moves, by the way. very slick! You're looking kind of mod all over. I need to clear my mental queue. Hey Antoinette, sorry to hear that you haven't been well. I've missed your posts. Your refashion is so damned cool. You'll be amused to hear that I can't open your posts at work - you come up as forbidden! glad you're feeling better! love the reconstruction! I can't wait to try this--more pics of the final product! More pics of the final product! (Pretty please.) 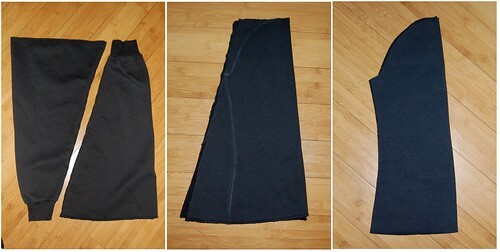 It looks fun and easy and fudge-able and those are my clothes-sewing requirements. It looks so warm and comfy, without the "this is all I could manage" factor of sweatpants. So cute and fun! I may need to hunt down a sweatshirt. Glad you're back. Ah, New Orleans. One day I will have to go back, and get me some more beignets. Cute sweatshirt redo! you can work wonders with any fabric. LOVE the picture on the right in your photo composite. GROOVY!! Don't worry about the hips, it's clear what your shape is under that - the tulip shape that the fullness gives is flattering on you. Your refashions really do blow me away every time. This is so cute, looks comfy and chic (such a rare combo) and you are utterly adorable with your poses. yay....this made me smile. and you totally made it work!! you look awesome. and comfortable. @glam.spoon @phill - I'd not thought of this being very mod, but you both mentioned it! I can see it now.